I DO NOT DO VALUE ($$$’s) APPRAISALS! OR ASSESSMENTS FOR INSURANCE OR ESTATES OR EBAY, ETC . 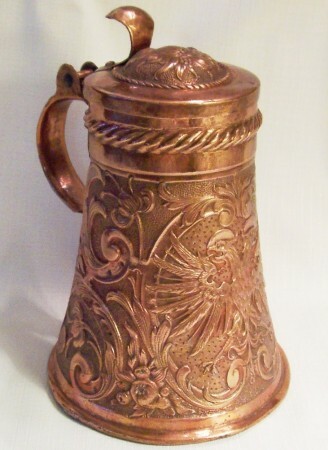 [Editor’s note 6-1-2013l Anyone interested in Copper, or old mining should enjoy reading this article ~ I did! 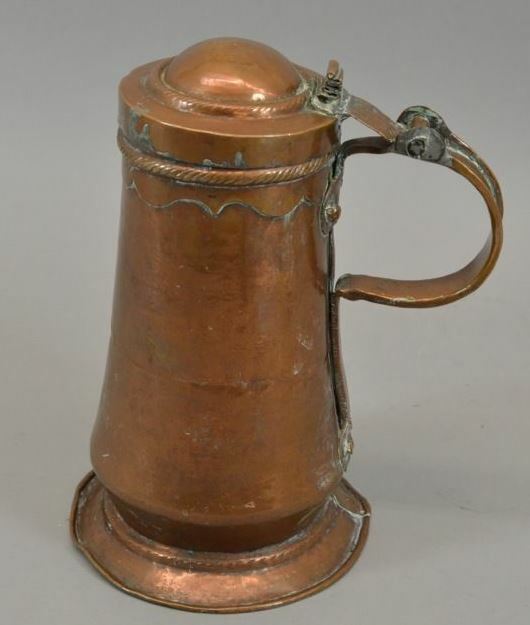 Shown ▲: About 1/5th of the copper beer steins in the Smith’s Museum and Tavern Collection “From Which to Drink..” These are all Bohemian and mostly large engraved serving steins. The carved wooden torsos shown are from large piece of ‘Neauveao-Renaissance’ furniture, or perhaps supporters for a very large staircase’ handrail. I recently got an email from a stein collector / seller that asked a question that pertained to this subject of this page. So I thought I’d just duplicate the question -in blue and italics! And my response here, thereby giving the reader access to the reason why this page even exists! “Now I have another question – you have divided all early copper in “Bavarian” and “Bohemian” categories. [YOUR] “Now I have another question – you have divided all early copper in “Bavarian” and “Bohemian” categories.” All? Not so! 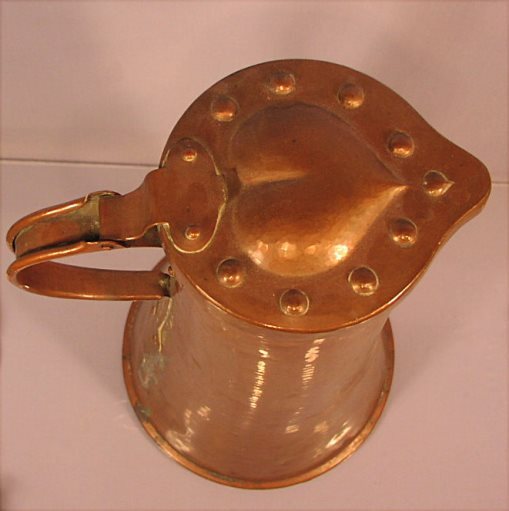 The intent of the (this web) page was just to define the difference between only those two centers of copperware production. This discussion was started years ago at a “Beer Stein College” exactly because of the reasons behind your question; that is: J. Vogt was incorrect (on purpose, or ignorant, or both) and I wanted to set the stein record straight. Photo above : Taken from a J. Vogt auction. That is a good question!……I will include this answer on the S/O/S webpage! 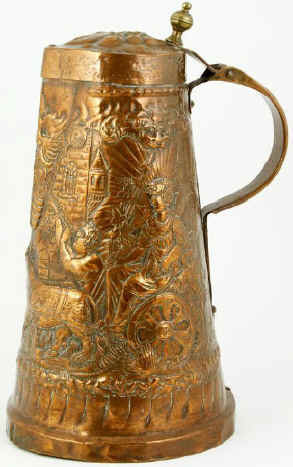 Vogt was a business man = Which sounds better to “German” stein collectors: “Nurnberg or Bohemian? 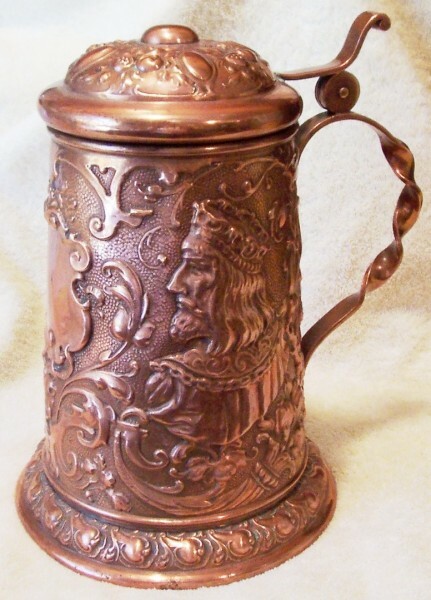 So J. Vogt [a well known German stein auctioneer= RIP] called them ‘Nurnburg’ and  no one ever “called him” on it, and  he never really said they were “made there”, he just inferred it. Also [2[ as the center point of Bohemia was only about 200 km from the old Bavarian border, I am certain some Bohemian copper pieces were sold there within that city (it was a huge European trade center) or migrated with the people when they moved closer to a big city from the hinterlands. 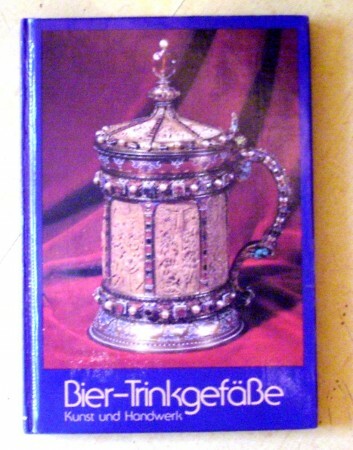 The book, “Bier –TrinkgefäBe- Kunst and Handwerk” [produced by “Rastal in 1978”]; on page 54 shows an example of those large copper serving steins (with that same handle, lid and hinge assembly that J. Vogt called ‘Nurnberg’) and the book labels the stein as from “The Guild of the Prague Maltsters – 1747.” Prague was in the center of Old Bohemia – now the Czech Republic. It is highly doubtful in my mind that, those Guild Masters would have ordered one of these steins to be made not even close to Prague, but in another country no less! Taking one part of the original question at a time: Believe stein auctioneers? 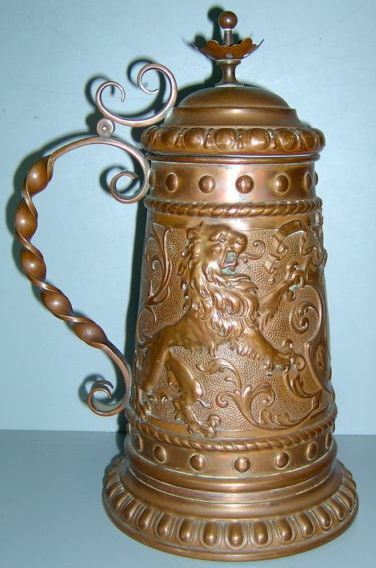 I can show you many, many mistakes both the German and USA stein auctioneers have made over the years. Just because one of them writes something down and publishes it, does that make it “The Stein Bible?” (And yes there are mistakes on this web site too!). 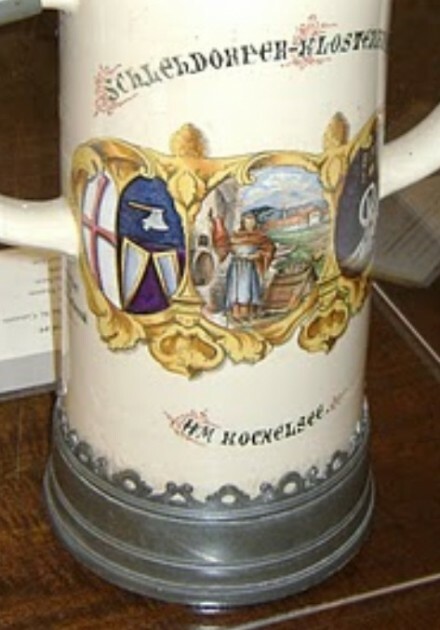 Mis-labeling of the scenes om beer steins has gotten so bad, that recently one auctioneer described an animal as “a bull” on a stein which clearly showed “his” milk bag. teats and all!! As I have advocated time and time again to collectors; build up a drinking vessel library and check everything. But as some of you probably have found out, most stein collectors in the US I know [read that “Most” SCI=ers] are not interested in facts, only what something is worth! 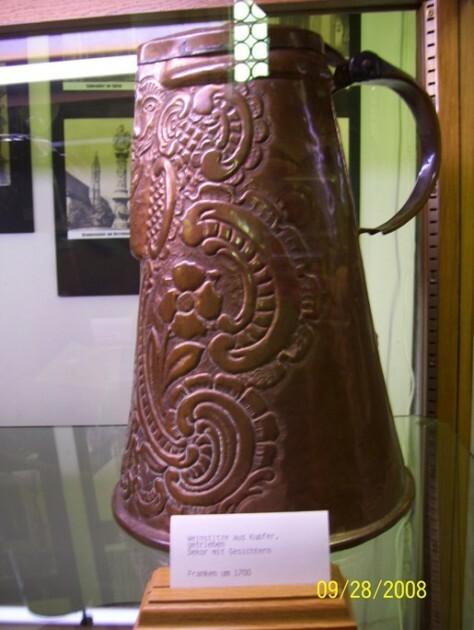 To verify how much confusion is out there about these Bohemian made pieces, I recently had a fellow stein collector and friend send me these photos ▲ ▲ & ▼ ▼ of 2 large relief Copper Servers shown within the Munich City Museum’s collection of beer steins. If one reads the small label in front of the piece it says they were made in FRANCE!! 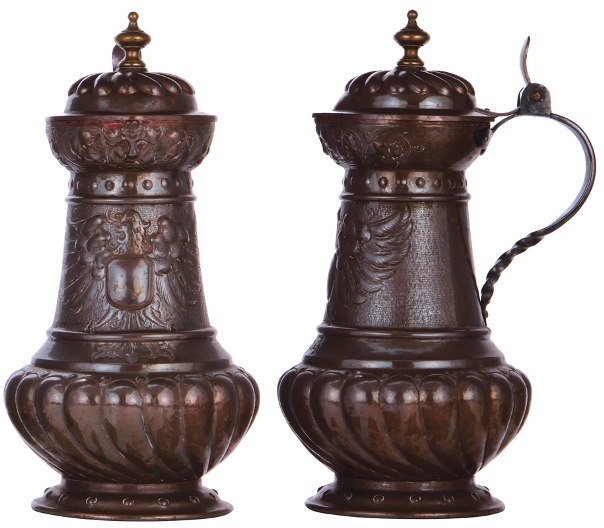 The shape of the handles and workmanship on both are a clear give-away as to the real country. 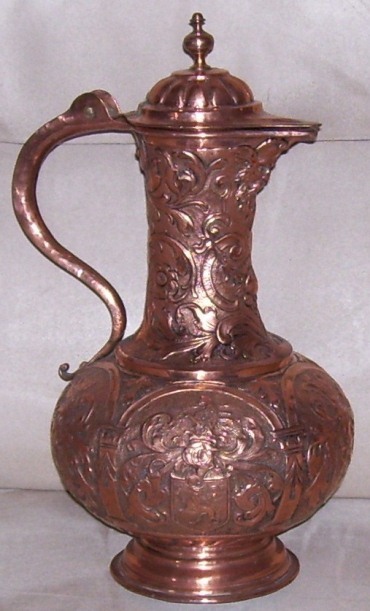 Below ▼ ▼ ▼ other examples for study of Bohemian copper workmanship – found on one of the web’s for sale web site’s. The first seen with a different than usual type = a domed lid. With lighter relief than most. 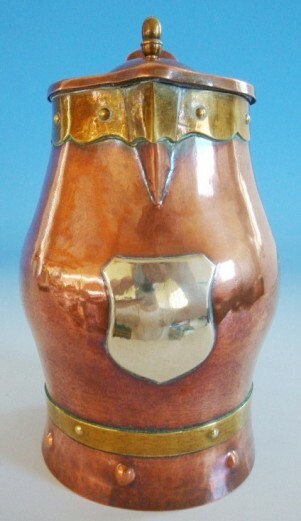 ▲ ▲Bohemian copper server – 26.4 inches tall. C. Late 1600’s – early 1700’s. 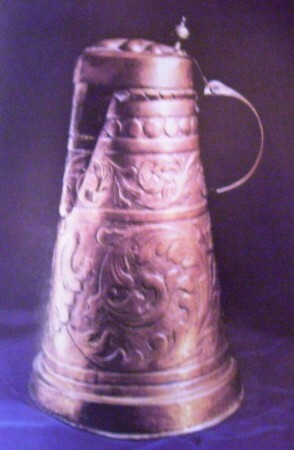 Photo clearly shows the twisted over sides on the handle and an unusual (for these copper pieces ) herring- bone design on the lower handle ; it is mostly found on old pewter ones. 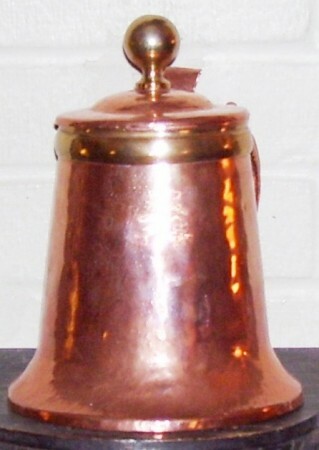 This stein is missing its “spoon style” thumblift, a common fault for this type of thumblift construction, instead of the brass ball/ urn type also found in this time frame. Above: ▲: Unusual lid design as many of these lids have relief shell shaped designs with at 3 to 5 sections such as shown just below ▼ – This heart relief work might indicate a special order. If one looks close you can see where the thumblift has been broken off again! It is pretty hard to get those repaired here in the states, as there is not a copper-smith on every corner. Photo of the heavy base construction. These Bohemian piece was made to last back then! And did so!! A German eBay seller wanted to start bids on the one above at 489 euro in early 2014 (even missing its thumblift, I believe he still has it for sale in mid 2014! 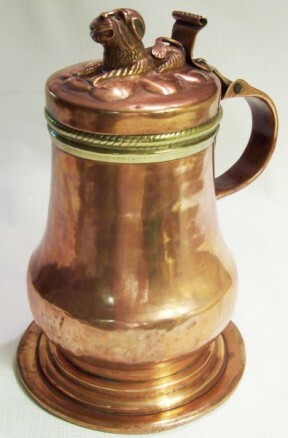 STEVE’S NOTE: Rather then make this a very long page, any additional Bohemian copper steins or servers I see I will add to the END of this page, so those that are interested in learning more will follow and view those; thers may just go on reading about the comparison. ▼ ▼ ONE OF MISSING LINKS ? What struck me right away was that the body and then the handle shape appeared “at first brush” to be a Bohemian piece. So I blew up the photos and noticed right away that there were several differences apparent to my eye! So I will now compare the two, using photo versus photo. 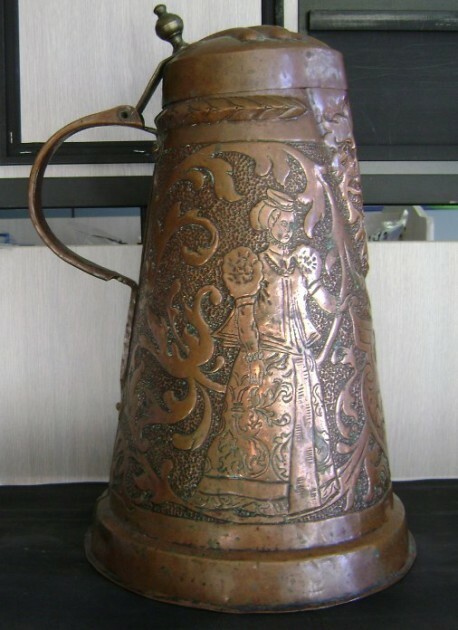 [Right] A very old Bohemian copper stein. 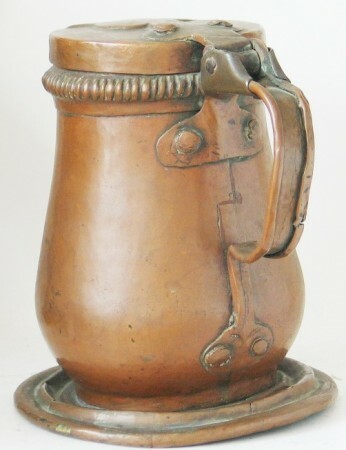 This one shows the rolled over handle sides, [FWTD] the rolled over base (for more support – probably used for heavy bar drinking.) The plain flat round shaped thumblift is missing, and this one has a very unusual brass support at the hinge. 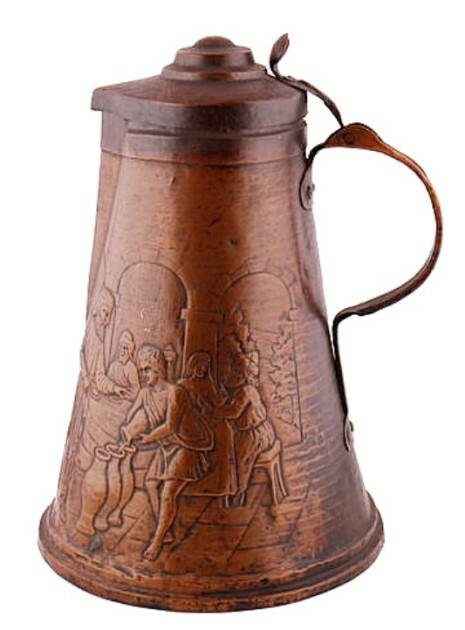 Circa mid to late 1600′ s.
The handle of the ‘Bavarian’ stein in question has no rolled over sides for added strength as one can see here on the ‘Bohemian’ stein above. 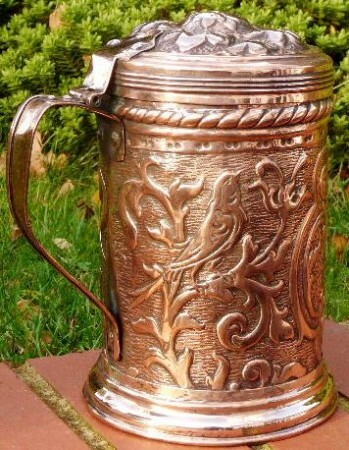 t not all ‘Bohemian’ steins have this rolled over handle edge! They stoped making them that way it sometime in the mid 1800’s I think. .
“Tri-foil cut” (engraved sometimes) handle attachments = Bavarian. 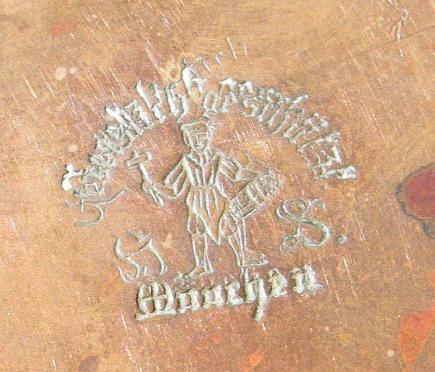 Most often found on steins made and stamped in Munich, see maker’s stamp just below. While the Bavarian’s handle shape looks fairly close to the “?” mark form, the end of handle does not come really close to the body, and these handle attachments have a specific cut and engraved design; which I will call “The tri-foil cut” (for the lack of a better term.) 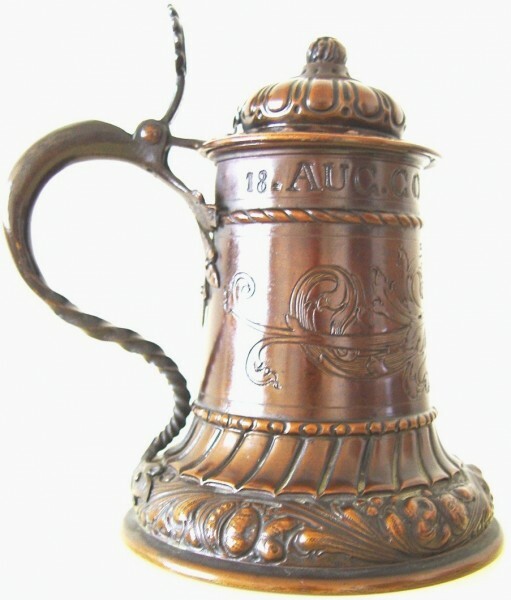 The older Bohemian steins did not have this; all the attachment edges were rounded with no “touch up” engraving, and also do not have that small point on the bottom. 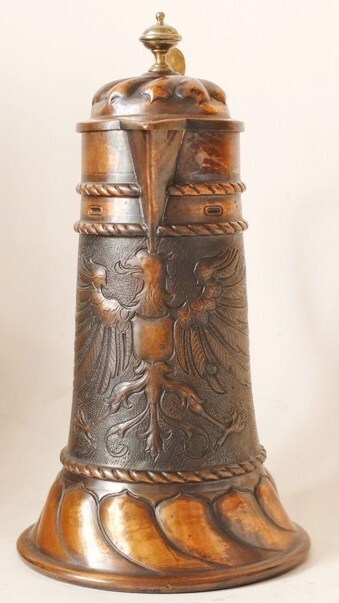 The wear (indicating) age of this newly shown Bavarian piece is significantly younger than comparable styled Bohemian pieces that I have seen. 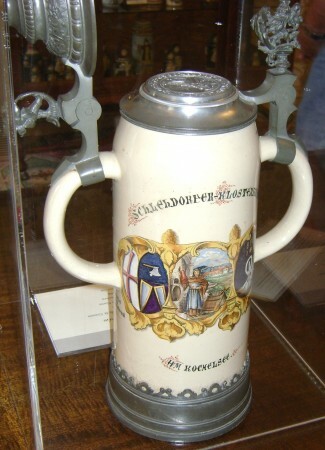 It carried a stamped maker’s mark, from Munich, (SJ & SG). 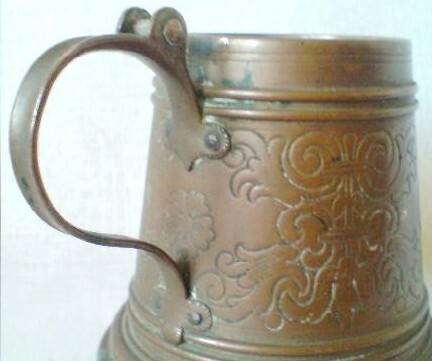 I have yet (even up to the end of 2015) to see a very old Bohemian stein that was marked. 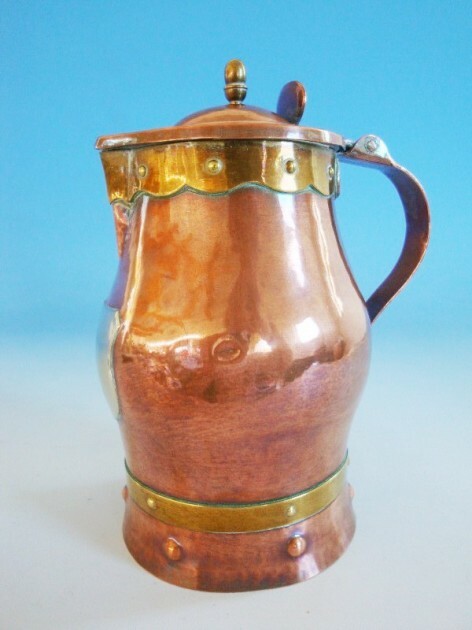 Now having reviewed all the aspects of this stein, and the fact that there were a few Bohemian pieces that were made with flat handles. I can now see where Mr. J. Vogt might have gotten support for his idea that these slanted side & large base forms came from Bavaria and not Bohemia. 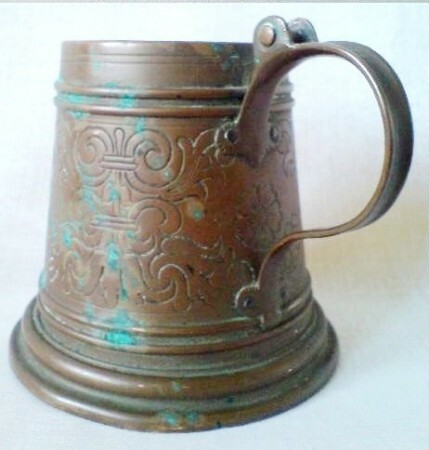 Here is another “cross over stein” = what appears to be a Bohemian produced copper stein, (by its thumblift and handle) it has an inscription on it to a Bavarian military unit stationed close to Munich. 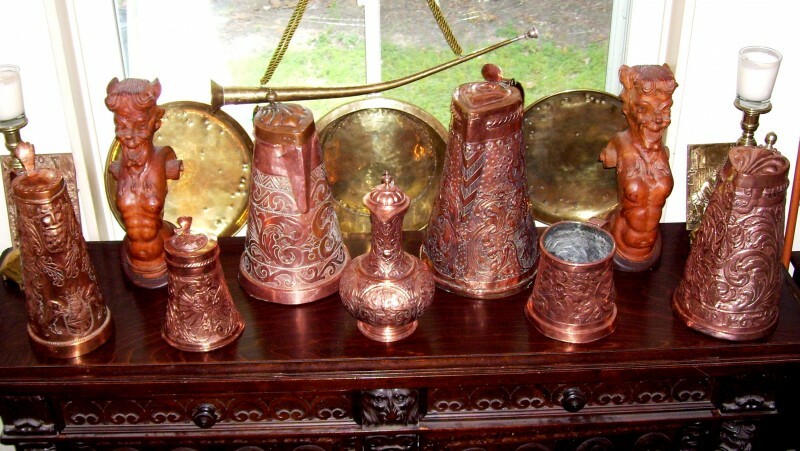 There was obviously a fairly big market for these Bohemian copper steins in Bavaria. 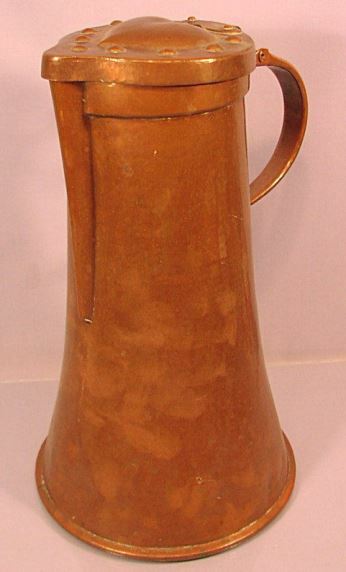 A relatively plain Bohemian piece, Circa 1830-60, with the typical bent up (but not rolled over) sides on the “?” mark handle but with a unique spade shaped finial at the bottom of the handle. [FWTD] Brass ball finial and rim around the top. Hard to find. 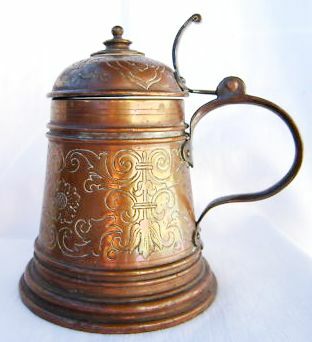 This stein, about 7 inches tall, also has a thick rolled over base rim to give it additional strength (as does the Bohemian example up above.) 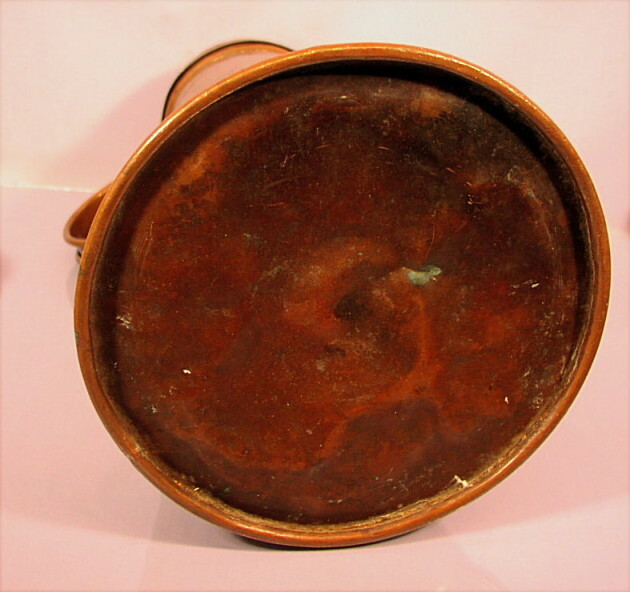 This is not normally found on later Bohemian copper steins, say from the early part to the middle of the 1770’s. 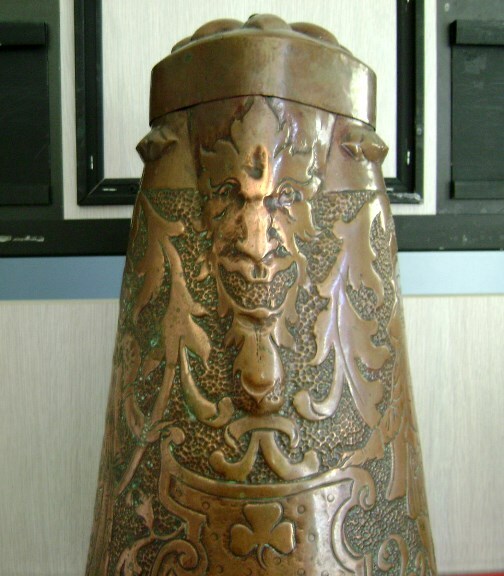 The medieval style lion’s head was punched out of the flat copper sheet on a mold, then finished off by hand soldering . The brass neck band was also soldered to the body. About 7 inches tall. Mid to late 1600’s. Very scarce! This little jewel was mine and I sold it! Can you spell: S-t-u-p-i-d ! Another with rolled over handle sides. On this on the ripped band was punched out of the body’s neck and not applied. 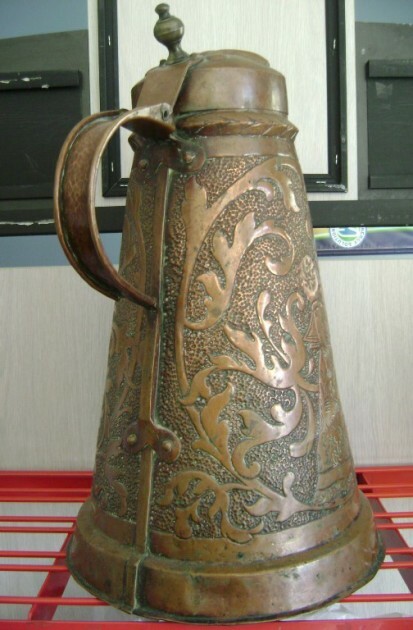 The handle’s end being elongated and coming further down the body of Bohemian pieces (looking like a question mark) is another sure sign of Bohemian origin, as is the lid to handle hinge arrangement. Stein is about 13 inches tall. Circa early 1700’s. 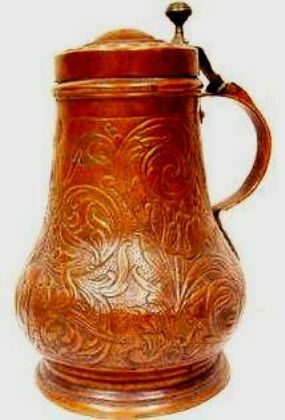 A Bohemian “Beer Mug”, late 1600’s – early 1700’s. The armorial engraving and repoussé work on these early pieces is outstanding. 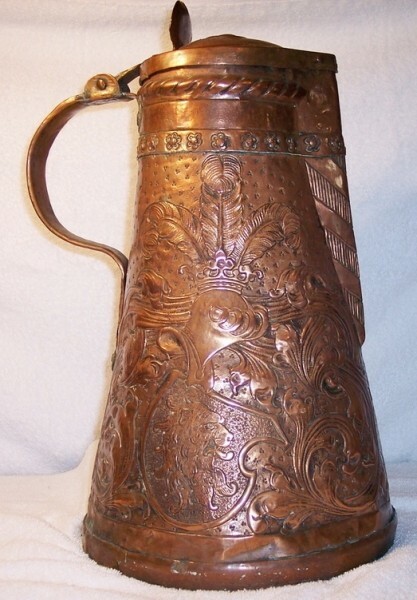 That workmanship is as good as any master silver-smith’s work, but the vessels were about 50% cheaper back then. 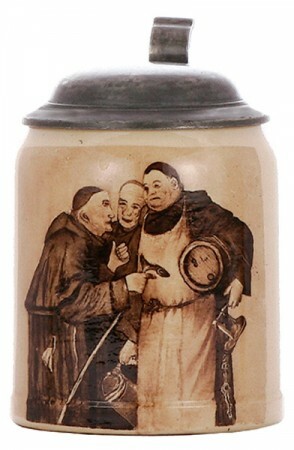 That these large vessels were used elsewhere and not limited to Bohemia is the scene on this 5 liter brewery beer stein (double lidded) showing a young monk holding one. 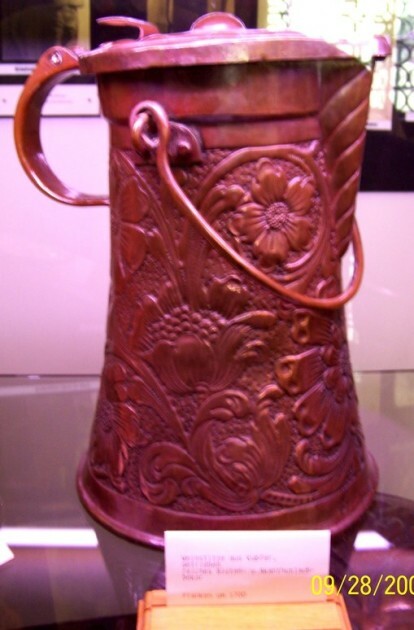 This large “pass cup ” / communal stein is from the local brewery in Kochelsee, a small town in South-eastern Bavaria. It carries a special presentation. These two are plain but large! 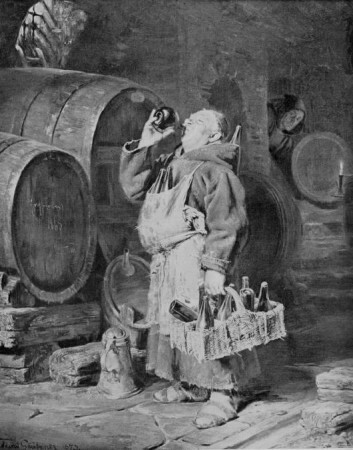 These are the kind depicted on the brewery beer stein just above ▲. Made for use not decoration. Both Ca, late 1600- early 1700’s. While I have had the server to the right for some time now, I just picked up another just a bit taller and it has a different lid design and thumblift. 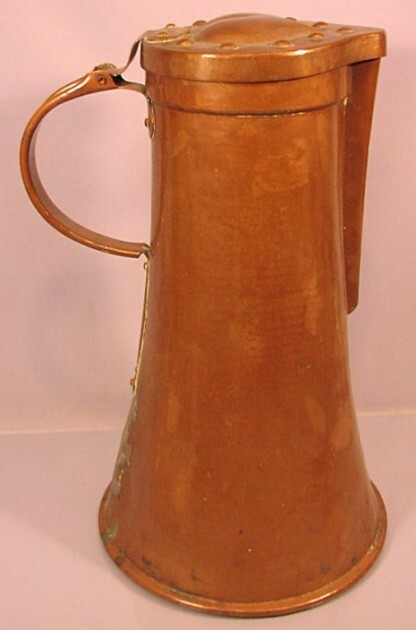 The .5 liter V&B Mettlach No. 1526 with the hand painted Cost of Arms [family] is just for size comparison. Shown again! 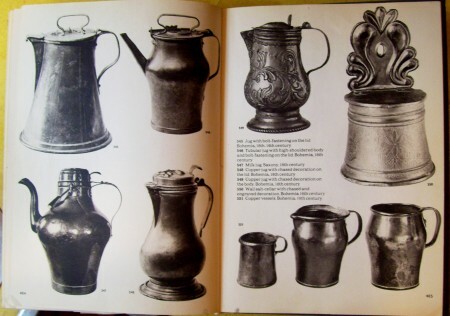 The landing display at “S.M.& T.” of Bohemian made Copper Steins (and a buch of old dreck), a few months later than this page’s opening photo. The servers are all very large and most from the very late 1600’s – mid 1700’s. Blow up to note the differences of the base rim and lid designs. 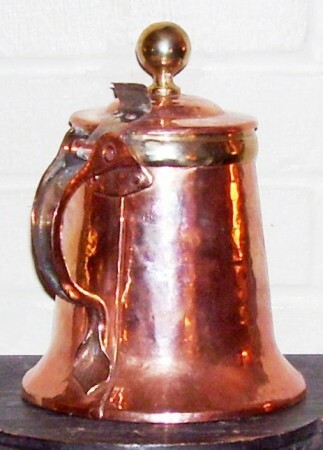 Flat ribbon thumblifts attached straight to the lid, and thin twisted handles are most often found on Bavarian made (Nurnberg and Munich) copper steins. [X-FWTD] The scene is a relief of Emperor Maximillian. Emperor Rudolf is on the reverse. 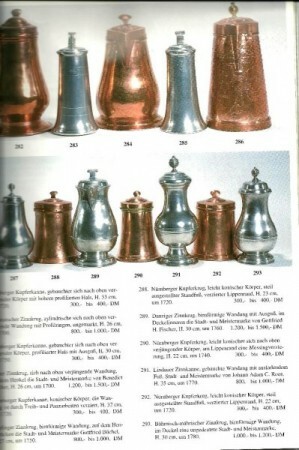 All the steins shown below ▼down to the double red line are all “stamped” or “pressed” sheet copper work. 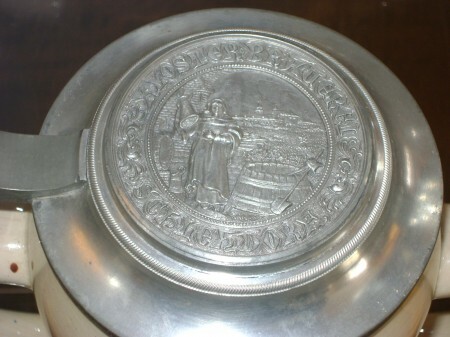 There is yet a third version, this one sitting on a pedestal base such as shown in Ill. AA below. 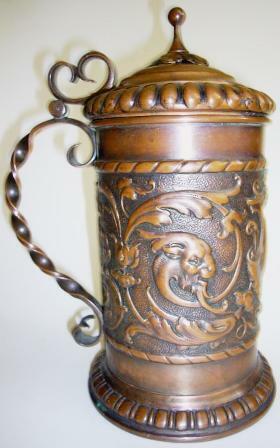 Here is a stein that has the twisted handle but it also is applied in the typical question mark style of the Bohemians, with an extra long section at the bottom. But this one is not ‘all’ attached to the body as the Bohemian ones are. 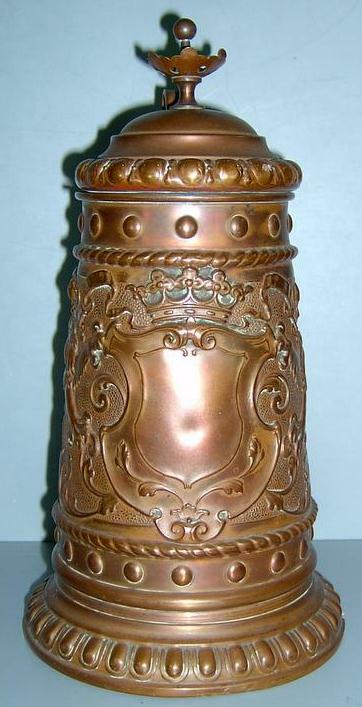 The relief work around the base and on the top make it a definite Bavarian (Nurnberg / Munich) copper stein. Hard to see in this photo is another Bavarian indicator; tooled ends (they appear as leaves) to the upper and lower handle–to-body attachments. I believe this to be made by (SJ & SG) Munich, . 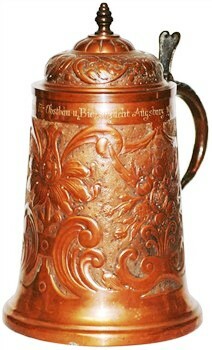 Another typical late 19th century Bavarian stein with a flat twisted handle (an added little touch are the cut ends) with nice but not too elaborate relief work. 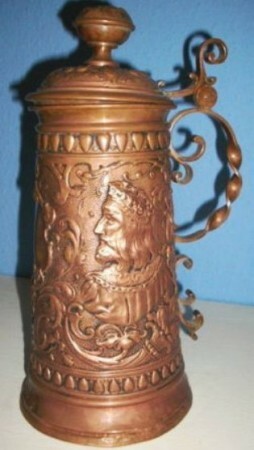 While the handle is not showing on this photo, it is obvious to me that this stein, Ca. 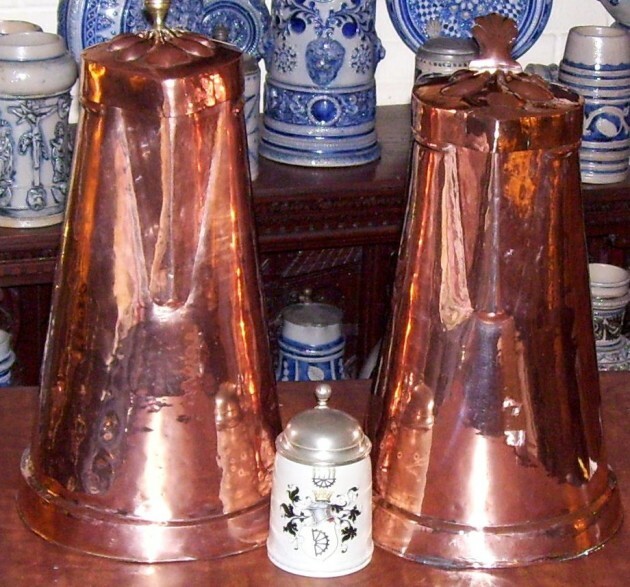 late 19th century.and the one above ▲were made by the same firm, most probably (SJ & SG) Munich. 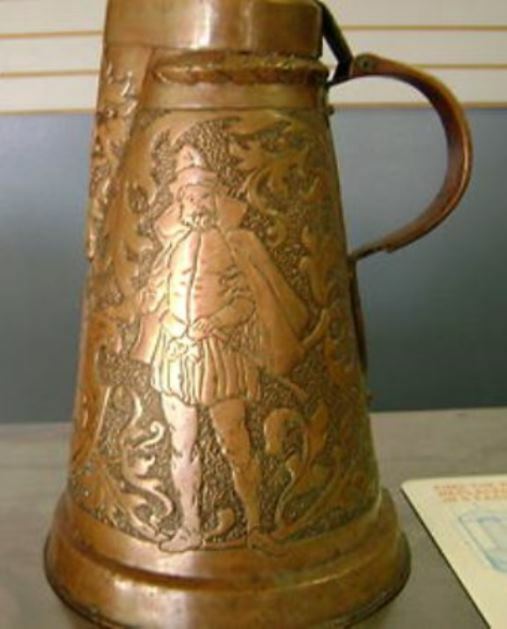 [L] This photo clearly indicates another Nurnberg / Munich touch, that of gold plating part of the stein’s surface for added effect. 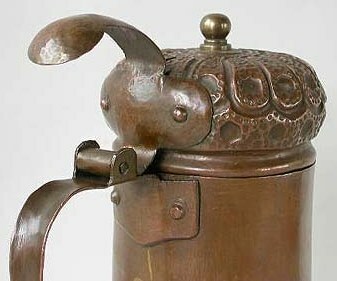 [R] Detail of repossed lid from the above stein, and the twisted handle attachment to it. 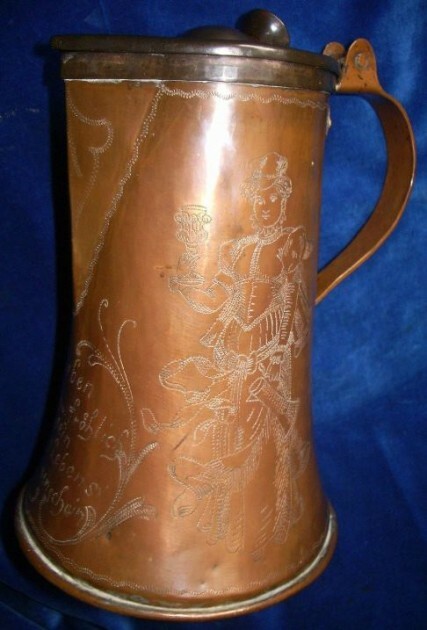 It also has the typical “shoe horn” thumblift found on most Nurnberg / Munich copper beer steins. And another, with enameled Coat of Arms for a painter. 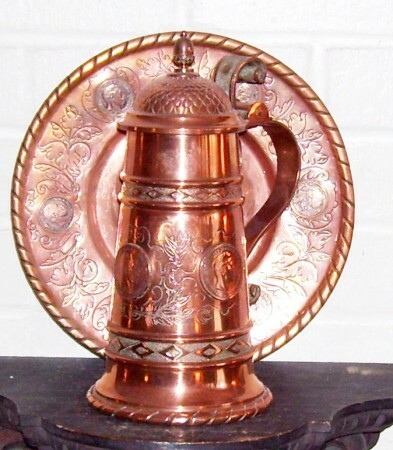 A half liter copper stein, with three mounted copper plated coins of the Three Kaisers of 1888, and its matching tray. [FWTD] While the hinge assembly is reminiscent of Bohemian work, it is very doubtful that this was made anywhere else but in Germany. 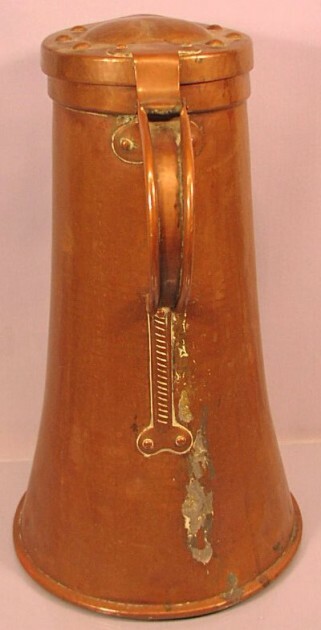 The handle has “stipple work” all over it, as shown around the diamonds on the two body bands. For more info on the Year of the three Kaisers of 1888, See: “1888 – The year of the three German Kaisers” in this site’s Compendium. A wonderful rendition of a cross between a Bellarmine face and a wild man or Bartmann;s face as a spout. 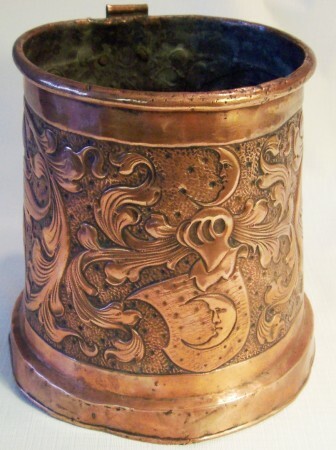 This beautiful Bohemian copper server did not end up in the “From which To Drink” Collection. It was offered for sale right after I had just been cleared of having throat cancer but I developed a case of shingles at the radiation’s on point of entry on my neck.., and I wasn’t feeling much like doing anything …let alone spending well over a half of a K and adding to the collection about then. Now I’m thinking that was a damn shame I felt that way! So I think I learned my lesson I saw this one and while nowhere near as old as the older relief one above, I just really liked it’s looks. especially the added brass; which is the primary reason one should have to buy any of this stuff! 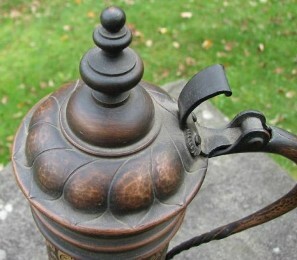 C.1850 with a really nice natural patina. It has a flat handle and a flat coin size thumblift. While I have had the server to the right for some time now, I just picked up another just a bit taller and it has a different lid design and thumblift . 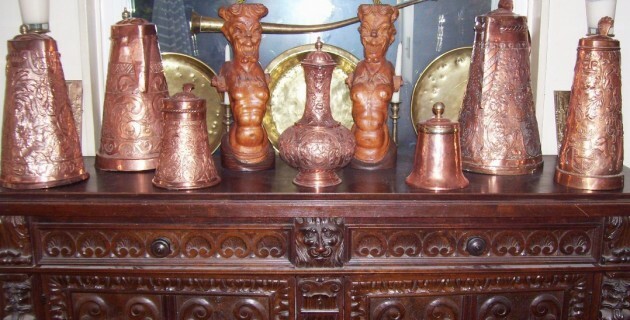 They now flank my cupboard top wthat has other large (non- Bohemian) copper pieces on it. 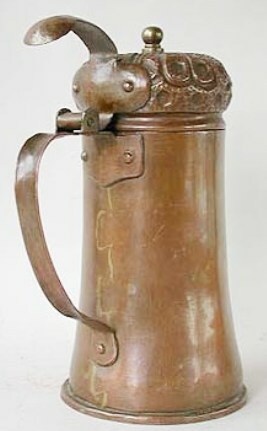 The .5 liter V&B Mettlach No. 1526 with hand painted Cost of Arms [family] is for size comparison.